Posted December 18th, 2012 by Dan - TexCom Technical Operations & filed under Features, How To. 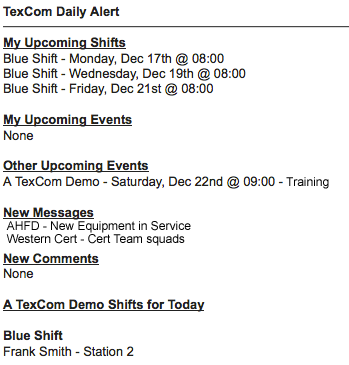 These are daily notifications sent to your email at the time you specify that lists recent messages and comments, upcoming events, and current shift information. This is a great way to quickly view the status of your organization without even logging in. To activate Daily Email Notifications go to My Profile->Preferences and activate the Send Daily Email Notification. Reminder alerts will send you a text message when an event or shift you are signed up for is imminent. For example, if you wanted to receive a message 30 minutes prior to the start of an event to remind you. To activate Reminder Alerts go to My Profile->Preferences and activate the Send Alert Reminder of Upcoming Events. Be sure to also specify what form or notification you want (email and/or mobile) as well as the time before the event start. This setting allows you to specify a daily quiet time where messages from TexCom will not be sent to your email or mobile device. Once the time has passed, these messages are then processed and sent to your email so you are still informed of happenings during this time. To activate Quiet Time go to My Profile->Preferences and activate the Enable Quiet Time.